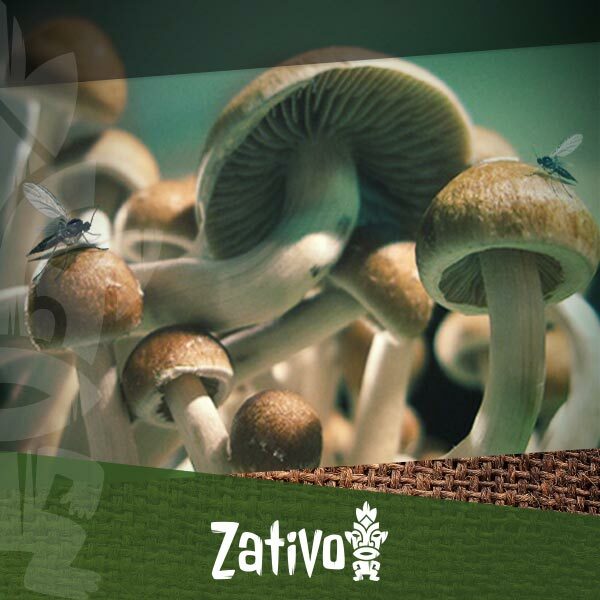 Although growing mushrooms is not particularly difficult, it requires a clean and sterile process for success. A single mould spore contaminating your substrate, your jars, or your equipment can be all that’s needed to ruin your entire mushroom culture. Read on to learn about mushroom contamination, how to spot it, and how you can prevent it. WHAT ARE THE SIGNS OF MUSHROOM CONTAMINATION? If your mushroom culture has been contaminated, there are normally (but not always) distinct signs for it. These signs depend on the particular type of fungus or bacteria that has contaminated your culture. Many common types of bacteria that can contaminate mushroom cultures can give the mycelium or the grains a slimy appearance. This slime occurs often in areas where the substrate presses against glass, which may show as slimy rings that can be yellow or brown around the grains. Sometimes, the bacterial slime can also show as a crust or gel-like substance on the grain surface. Not all types of mushroom contamination are necessarily visible. Sometimes, it can be a strange odour that may give away that something is off with your mushroom culture. An unusual odour can also be helpful in identifying contamination where the contaminant fungus otherwise may look just like the mushroom mycelium. Check for mouldy and musty smells and any odours that don’t smell like mushrooms. Fortunately, many types of moulds have a distinct colour that makes them easy to spot. Watch out for any of the typical colours of mould, which can be greenish, blueish, white, grey, or black depending on the type of fungus. Keep in mind that not all discolouration in your mushroom jar is necessarily due to contamination. When your mushroom culture is contaminated with unwanted fungus spores, this means that two fungi are growing at the same time. Since we’re dealing with two fungi that are competing with each other, there are normally also distinct borders between these two mycelia where they meet. This is also known as sectoring. So watch out for areas within your substrate that appear distinct and separated from the rest of your culture. Sporophores are thin, hair-like structures of a fungus. When they first appear, they may not be visible to the naked eye since they can be very small. But some sporophores can also be larger, and this is when you can spot them. A magnifying glass can help you seeing these whisker-like hairs that have a tiny “bubble” on the end. Some types of moulds can form a very dense mycelium. If you cultivate in jars, this unwanted fungus can quickly fill up the volume of the jar. You can spot it by its smooth, sponge-like appearance, which is distinct from the actual mushroom mycelium. Many types of fungus may be difficult to spot with the naked eye, but a magnifying glass can help. Fungi sporophores often appear as a dust or powder-like layer on top of your substrate. With a magnifier, you can clearly distinguish this “fungus dust” from other, harmless discolorations of the mycelium. When your substrate is contaminated, the contaminated section may become soft, squishy, and crumbly. You may spot such a soft patch on top of the substrate due to its white colour, which makes it is clearly distinct from the rest of the substrate. Penicillium is the most common type of mould. The spores of the Penicillium fungus spread through the air and can easily contaminate the substrate. The mould can then spawn in the jar where it quickly spreads and can take over the entire mushroom mycelium. A Penicillium contamination normally starts out white, which can at first make it difficult to distinguish from the mushroom mycelium. The colonies of the Penicillium usually have a circular shape. Penicillium often appears on wood, which is the reason that mushroom cultivators should never use wooden trays. Fortunately, Penicillium contamination rarely happens after spawning. Most of the time, it affects uncolonised grains. Penicillium has a musty dirt smell. The Aspergillus fungus is another very common fungus that travels through the air and can infect your mushroom cultivation. The mycelium of the Aspergillus can be light-gray with a similar appearance to your mushroom mycelium. Some species of Aspergillus can be yellow, black, green, brown, or blue, and the A. versicolor variety can take on a wide variety of colours. Sometimes, the colonies of the Aspergillus may form a ring with a denser mycelium at the edge. Aspergillus can have a musty, oily smell. Just like Penicillium and Aspergillus, Trichoderma is a common mushroom contaminant. It is a particularly aggressive fungus that has ruined countless mushroom cultures. The Trichoderma mycelium often has a light grey colour, which makes it not always easy to spot. When contamination has set hold, after the spores may have been brought in with soil, dust, or clothing, it will likely first show as a thick, white growth on top of the substrate. The spores of Trichoderma may produce a mycelium that can be yellowish or greenish in colour, often with a distinct bright white ring surrounding the colony. Contamination from Trichoderma can happen at all stages. What makes it particularly tricky is that you may not notice early contamination since the sporulation may only happen late after spawning. For this reason, mushroom cultivators may want to do smell testing so they can catch this mould before it spreads. Unfortunately, not all types of Trichoderma have a distinct odour, although some species have an scent that resembles coconut. Bacillus isn’t a fungus, but a type of bacteria. Nevertheless, it is a common contaminant of mushroom cultures, with the heat-resistant B. subtilis being the most common variety. Contamination with this bacteria may show as slime or crust on the substrate. Contamination with the bacteria is almost always due to unsterile equipment. There is a particular risk for contamination when spawn is incubated above room temperature. You can identify Bacillus contamination due to a foul and rotten smell that may give it away. Pin mould got its name because it forms thin hairs (sporophores) that have a tiny head. It is a common contaminant that can affect spawn, but it appears less so on substrates. Rhizopus is yet another common contaminant. What makes Rhizopus tricky to deal with is that it grows extremely fast. Similar in appearance to pin mould, Rhizopus develops hair-like sporophores with a tiny head. Rhizopus has a sour odour. Sometimes, the smell of the fungus may also resemble alcohol. The mycelium of Fusarium can easily be mistaken for mushroom mycelium since it has the same white colour and also grows at the same speed. Fusarium, however, turns bright and distinct colours that can be pink, purple, orange, and yellow after a couple of weeks. Many times, fusarium is introduced due to unsterile equipment and may often occur in PF jars. Yeasts are another common contaminant that, just like fungi or bacteria, can ruin mushroom cultures. Oftentimes, a yeast contamination will appear anywhere in your jar as small spots that can be white or yellow. Other types of yeasts may appear like a bacterial contamination. Substrates are usually not contaminated by yeast, but it can be present in the spawn from where it will grow. Yeast can have various odours. The above are just some of the most common contaminants that can affect your mushroom culture. Many more types of organisms including fungi, bacteria, and yeasts exist that can take over your mushrooms, or at best can greatly decrease your yields. You do not want this to happen. Here are our tips on how you can prevent mushroom contamination. When you want to grow mushrooms successfully with little risk of contamination, nothing is more important than a sterile environment and a sterile process. With most types of contaminants, a single fungus spore or bacteria can be all that’s required to contaminate your mushroom culture. Now, the average hobby mycologist doesn't grow their shrooms in a 100% sterile environment such as a lab. Nevertheless, there are some things you can do to reduce the risk of contamination. Most contaminants such as mould and fungus spores are spread through the air. They can be anywhere, even in seemingly very clean environments, and you can’t see them. This makes avoiding these airborne contaminants somewhat challenging. In professional labs, scientists use special cabinets with filtered air called laminar flow hoods. The downside is that this specialised lab equipment is very expensive. This puts it out of range for the casual hobby mushroom grower. On the other hand, if you’re into some DIY, you may be able to build a semi-professional laminar flow hood for yourself. As an alternative, you can use a still air box or a SAB. A still air box may not be as advanced as a laminar flow hood, but it can still make for an adequately clean environment for mushroom cultivation. A SAB is basically a large tote with two holes on the side for your hands. This “lab in a box” allows you to sterilise the inside of the tote with alcohol while you can work on your cultivation through the holes in the box. Airborne contaminants are one issue, but contaminants are also often brought in with the substrate. Many bulk substrates and grains contain a host of unwanted organisms that you need to eliminate or at least reduce before you use them for cultivation. Because of that, you need to sterilise them before inoculating with a mushroom culture. A good way to sterilise blocks of sawdust and grain spawn is with a pressure cooker that is big enough to hold all your material. Place your sawdust fruiting blocks into the cooker and sterilise them for 2.5 hours. Grain spawns don’t take as long to sterilise, around 1.5 hours. Sterilising is a process where you eliminate all forms of bacteria. Pasteurisation is another method of heat treatment that eliminates not all, but the majority of bacteria. Unlike with sawdust blocks, pasteurisation is sufficient if you use straw as a substrate. To pasteurise your straw, heat it to 65–82°C for at least 1.5 hours. Some cultivators put the straw into a water bath in large pots or drums where they heat the water with a burner. Now that we’ve learned how the environment such as the air and your substrate can be sources of contamination, but we didn’t yet take into account one other, major source of contamination: yourself! Your clothes, skin, and hair could all be carrying contaminants, which means that cleanliness for successful mushroom cultivation is extremely important. Before you do any work on your cultures, take a shower and wash your hair. Don’t just take a quick shower, but clean yourself well, including under the fingernails as well as behind the ears and all the other spots on your body. Hand-sanitiser can be helpful so you can eliminate surface bacteria on your skin. Professionals in labs use scrubs when they get to work. You may not have a sterile lab coat on hand, but you should definitely use freshly washed clothing before you start working on your mushrooms. Consider getting a face mask as well. It would be pretty pointless, even if you work in a very clean environment, if the tools you are using aren’t properly sterilised. In other words, you need to sterilise all your tools such as your scalpel, blades, and syringes before you use them. When you use a scalpel or blades for transfers, it is imperative that they are sterile. To sterilise them, heat above a flame for 30 seconds until they are glowing red. For this, a Bunsen burner or an alcohol lamp will be ideal, but you can also use a lighter if you don’t have one at hand. Obviously, you can’t heat up syringes and other tools made from plastic above a flame. To sterilise these tools, you can use alcohol. Alcohol is also essential so you can wipe off all kinds of surfaces and to clean jars and bags. A bottle or two of rubbing alcohol (isopropyl alcohol) along with some paper wipes will go a long way to help you keep things clean for your mushroom grow. You may likely not achieve a 100% sterile environment to inoculate your mushrooms. After all, contaminants such bacteria and fungi can be everywhere and at all times. But with the tips from this guide, you should be able to reduce the risk for mushroom contamination significantly!